For the prototype level in the Simon Wai prototype of Sonic 2, see Aquatic Ruin Zone. 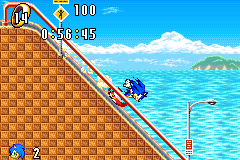 Neo Green Hill Zone is the first level in Sonic Advance. Set in a beach-like area with palm trees and checkered soil very much like normal Green Hill Zone, the zone fills the Tropical island theme for the game. Distinguishing features include beach umbrellas and deckchairs, as well as an iron bridge at the end of Act 2 (for the boss fight) which leads into Secret Base Zone. Unlike other levels in the game, this zone has no bottomless pits. There is a bug in Act 1 where, if you run down the long slope while playing as Knuckles or Amy, you can go off-screen and straight through a solid wall. The Special Spring for this level is located at the end of Act 1. You will either need for Sonic to use the speed boost at the end to reach a platform going up and down, or for Tails to fly up there. You can also reach it with Knuckles by gliding a little before the ledge where the spring is at. There is an arrow of rings hinting at the location of the spring. The name for this Zone may be a reference to the Sonic the Hedgehog 2 (Simon Wai prototype). The prototype has a level named Neo Green Hill Zone, which is actually an early name for Aquatic Ruin Zone. Kerokero - Frog-like badnik which jumps in the air. Similar to the Mantises found in Marble Garden Zone from Sonic 3. Stinger - A Buzz Bomber-esque badnik that shoots energy balls from its stinger. Kiki - Monkey robot with the same name and likeness of those found in Sonic Adventure 2. Rhinotank - Rhino enemy similar to the ones found in Sonic Adventure. Gamigami - Crabmeat-like enemy that shoots fireballs from its claws. During the development of Sonic Advance, many screenshots featuring the HUD shown on the right emerged. These are all very strange compared to the final—the alignment of the ring count and timer are lower than they should be, and the lives counter (complete with wrong palette) is further right than it is in the final. The ring used in the prototype screenshots is a bit thicker and the font used in the HUD was slightly altered to be slightly taller and to utilize inward shadowing. For Neo Green Hill Zone specifically, the clouds and water are in a different formation than the final in this shot. The sign and lightpost are not in the final game either. This page was last edited on 27 March 2018, at 10:27.